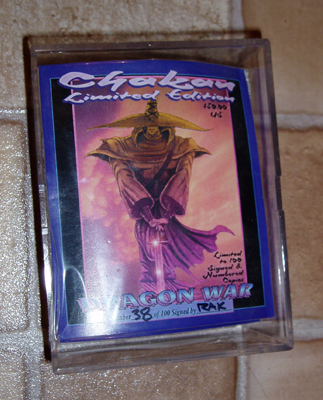 Here is the CHAKAN Limited Edition Dragon War Game I have for sale. 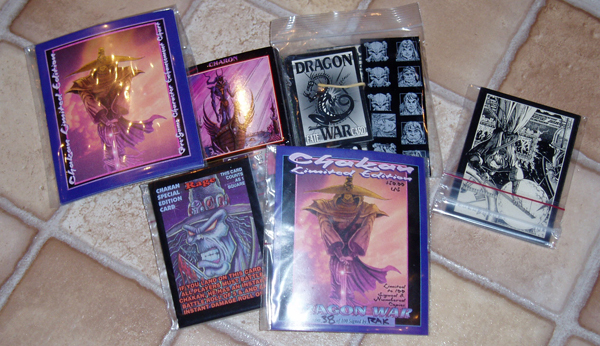 There were just 100 of these Chakan Games produced and they come with all the cool stuff pictured below! The Chakan DW cards and Pregame charts are only available in this set!!! Enjoy this RAK animated short I call Uni The Unicorn and then check out the CHAKAN Limited Edition Dragon War Game. Below is the cool swag you get in the game pack. They come signed and numbered for only $50.00. To see how the DW game plays, go to the DRAGON WARS RULES page.